“Ask a Buddhist” is a recurring column on SpokaneFāVS, an online newspaper covering religion, spirituality and ethics in the Inland Northwest, where the Abbey is located. 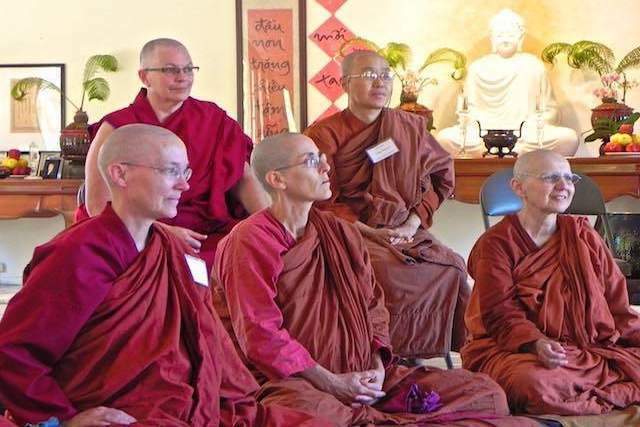 Readers can send in questions on Buddhist faith and meditation and receive responses written by Abbey monastics and longtime Abbey supporter Sarah Conover, a Dharma student of nearly three decades. Articles address everyday topics like romance, mental health, and grief as well as questions concerning traditional Buddhist teachings and the monastic life. Sarah began hosting the “Ask a Buddhist” column in 2013. Click on the links below to read articles published in 2018. Have a question of your own about Buddhism? Submit it by clicking here. How Do I Know If I’m Buddhist? Buddhism is a spiritual path based in reasoning and validated by experience, so it’s important to investigate the teachings critically to see if they make sense for you. Does being Buddhist mean that one must forgive pain brought on by others and if yes, should one allow the hurt to be repeated? Generally speaking, the lifestyle of a Buddhist nun is simple and disciplined, involving study, meditation, and service. As we mature into our ordination, this lifestyle makes our lives rich with meaning and joy. The Buddha taught many ways to meditate, each with its own purpose and intended outcome. But there are two main types of meditation: stabilizing meditation and checking meditation. What are some of the miracles the Buddha performed? How come these don’t make him a god? Everyone grieves in their own way and there’s no “right way” to do it. The purpose of a Buddhist shrine or altar is to remind us of our objects of refuge—the Buddha, Dharma and Sangha— and also of our potential to attain Buddhahood. Do Buddhist schools of thought view spirits as a form coming from the mind consciousness or are such things only seen by an awakened mind? As we learn to observe our experience in meditation, we learn how negative emotions and behaviors are harmful to us and positive emotions are helpful.